Rating: 6.9/10. From 36 votes. 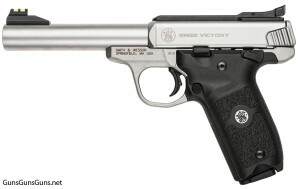 Summary: The description, specs, pricing, photos and user ratings for the Smith & Wesson SW22 Victory pistols. The SW22 Victory from the left. You can replace the barrel via a single screw located beneath the barrel. Removing the screw also allows you to take-down the gun for cleaning. Note: This gun reportedly will place S&W’s 22A pistol in the company’s lineup. .22 LR 10+1 9.2″ 5.5″ 1.1″ 5.5″ 36 oz. The SW22 Victory from the right. The SW22 Victory with the camo finish. 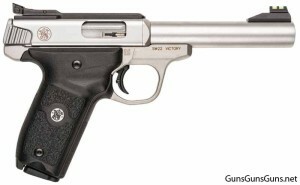 This entry was posted in .22 LR, $251-$500, Full size, Semiauto, Smith & Wesson on January 11, 2016 by Staff.